Known to “Star Trek” fans the world over for her role as Counselor Deanna Troi, English-born Marina Sirtis began her acting career as a member of a West Sussex repertory company at the Connaught Theater. During her time there, she appeared in productions of “What the Butler Saw” and “Hamlet” before parlaying her stage experience into film and television roles. Marina Sirtis’ early television work includes appearances and guest roles on British series such as “Raffles,” “Hazel,” “Minder,” “Up the Elephant and Round the Castle” and “The Return of Sherlock Holmes” which also received an airing on PBS stations in the US. With her career having been established in her homeland, Sirtis set her sights on international stardom and moved to the US in 1986. It was around this time that “Star Trek” creator Gene Rodenberry began casting for a new series based on his lauded and much loved original series. Dubbed “The Next Generation,” the series looked to introduce Rodenberry’s vision of the future to a brand new audience. Originally auditioning for the role of security chief Lt. Macha Hernandez, (later called Tasha Yar and eventually played by Denise Crosby). Rodenberry felt Sirtis was a much better fit for the character Deanna Troi, a half human, half Betazoid who can read the emotions of others. With a coveted seat next to Captain Picard on the bridge, Counselor Troi was one of the respected and trusted characters on board the Enterprise and Sirtis’ portrayal of the character endeared her to fans through seven television seasons and four feature films. 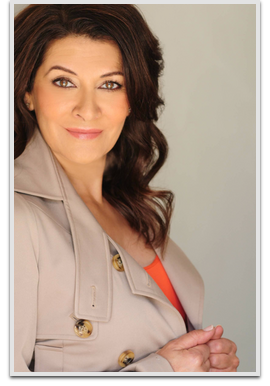 Beyond her live action work, animation and gaming fans will recognize Marina Sirtis’s voice from her roles in the fondly remember Disney series “Gargoyles,” “Adventure Time,” “Family Guy,” “Young Justice” and the hit “Mass Effect” gaming franchise.